We love what we do! We take the greatest pride in providing the best quality services for every client. You do not pay until you are a satisfied customer, GUARANTEED!! Contact us if you want to speak to one of our customers. On behalf of my family, we would like to express our sincere appreciation for the wonderful job you did on the DVD/montage of my father. You and your wife were so kind and comforting during my time of grief. The DVD was a great tribute to honor his memory. I've hired Memory Imprint Studio to revamp our outdated website. Wow, what a difference, I have to say. Not only does the site look ever so elegant, professional and attractive, it also laneded more visitors each month since its launch last December. I highly recommend the talent and skills of Memory Imprint Studio who will continue working with us on future updates and search engine optimization. AMAZING!!! 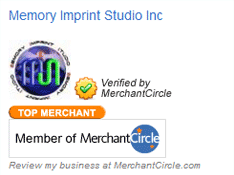 I selected Memory Imprint Studio based on the website dynamics and services offered. I was in a hurry to get a video produced for a very important customer and our timeline was not realistic but Tony made it happen. Some days I e-mailed him at 11 o'clock at night and he would get back to me within a few minutes. This was the first video we have produced for our products and we really didn't have an idea of what we wanted so Tony came up with some great ideas and the project came together nicely. Even when we needed last minute changes he was able to get it completed. I definitely recommend Memory Imprint Studio's for video projects because you will get more than you expected! Excellent Service and great work! I am so glad that I found Memory Imprint Studio for our photo restoration. Tony was very responsive to communications via email and/or phone and the end result was exactly what I was looking for (I am very picky). They were a pleasure to work with and we will definitely bring more business their way! I checked around for several companies to transfer 40 home videos to DVDs in order to preserve our memories created over the years. I wasn't comfortable shipping these very important tapes to some company that was out of state. After talking to Tony, it was very clear that he understood our goals and how meaningful the project was to us. He was very diligent in his efforts and came through on time. He went the extra mile to make sure that details were not overlooked. I highly recommend this company. WOW! the web site design is outstanding! Tony, (the introduction flash video) is very impressive. we love it! ... Great job. Thanks. Just wanted to let you know that everyone loved the DVD! Jon thought it was amazing and said he loved every minute of it. Thanks for helping to make his graduation celebration so special!! We've utilized this company twice now for photo restorations, and the end result both times was fantastic. The owner goes out of his way to beat your deadline and exceeded all expectations. We would highly recommend without reservation! This is an excellent company which could provide various services including 3d photo montage, photo restoration, graphic design, video production. I used their service to make a DVD video from the photos of my one-year old son. The final product is so beautiful that I am extremely satisfied. Not only the video itself, also the DVD cover printed on the disc. The video is fully customerized, the displaying style, the background music, and the video frame. The beauty of their service is you can show the nice moments of your loved ones to your friends and relatives in a convenient way. I highly recommend their service to keep the memory forever.